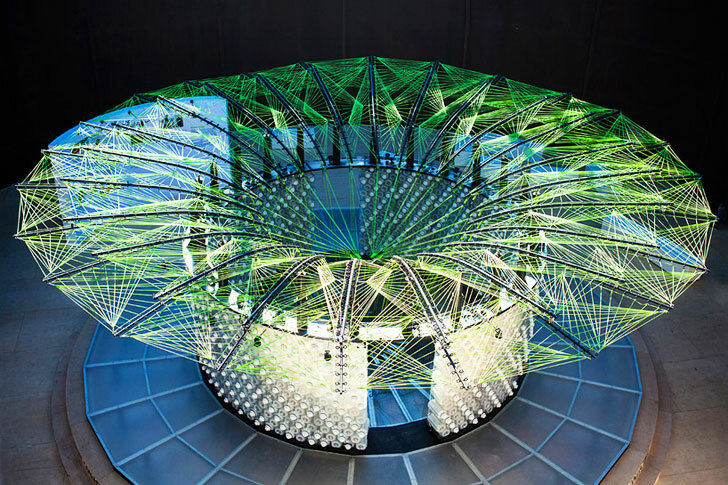 Beijing Design Week is in full swing, and Nike’s Flyknit Collective Beijing Feather Pavilion is a sustainable stand out from this year's show. Designer Arthur Huang of Miniwiz created the interactive kinetic installation, which moves and morphs as visitors walk around and through it. Taut green cables create the webbed ceiling, which draws and contracts around a collection of Flyknit sneakers, emulating the movements of the athletes that wear the line. Nike’s innovative Flyknit sneaker is the first continuous shoe without seams – the single-piece upper is woven together from a network of fibers using high-tech manufacturing techniques. Drawing upon the shoe as inspiration, the pavilion uses sustainable materials to create a striking structure crowned by a grid of colored ropes that cascade from its center. Visitors may play, bounce, or exercise on the structure, which creates different spatial movements when the cables stretch in different angles. The entire pavilion is made from recycled materials – from the cables to the plastic walls. Recycled plastic POLLI bricks make up the translucent base. The circular bricks seem to glow with ambient light, which accentuates the green web of cables that rises in a halo above the Flyknit sneaker display. Huang is no stranger to recycled materials. The Taipei-based designer and his firm have been dedicated to sustainability from the get go – they famously designed the EcoArk, a structure made from 1.5 million recycled PET plastic bottles. The innovative Flyknit sneaker put itself on the map by being the first continuous shoe without seams, as well as sustainable materials. With the shoe as inspiration, the pavilion combines both the usage of sustainable materials and a seamlessness that is achieved with the endless grid of colored ropes that cascade from the center of the structure. Visitors may play, bounce, or exercise on the structure, which creates different spatial movements with the cables that stretch in different angles up to the ceiling, almost glowing in rich hues of purple and green. 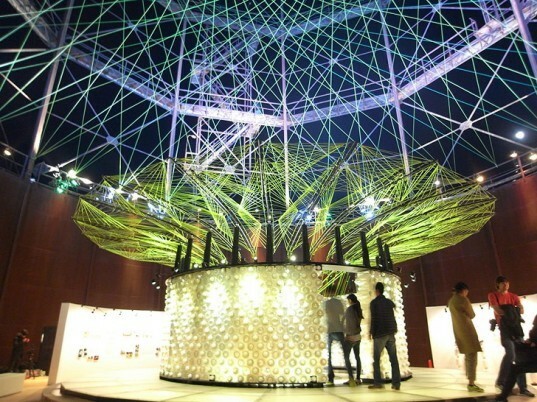 The entire pavilion is made from recycled materials, from cables to plastic walls. TPU POLLI- bricks make up the translucent base, which are made from compressed and recycled plastic. The circular bricks seem to glow with ambient light, which accentuate the green web of cables that create a halo above the Flyknit sneaker display. Huang is no stranger to recycled materials. The Taipei based designer and his firm have been dedicated to sustainability from the get go, famously designing the EcoArk, a structure made from 1.5 million recycled PET plastic bottles.